This is COMO GAME JAM IV Entry. Quickly! You're challenged to a dual to the death. 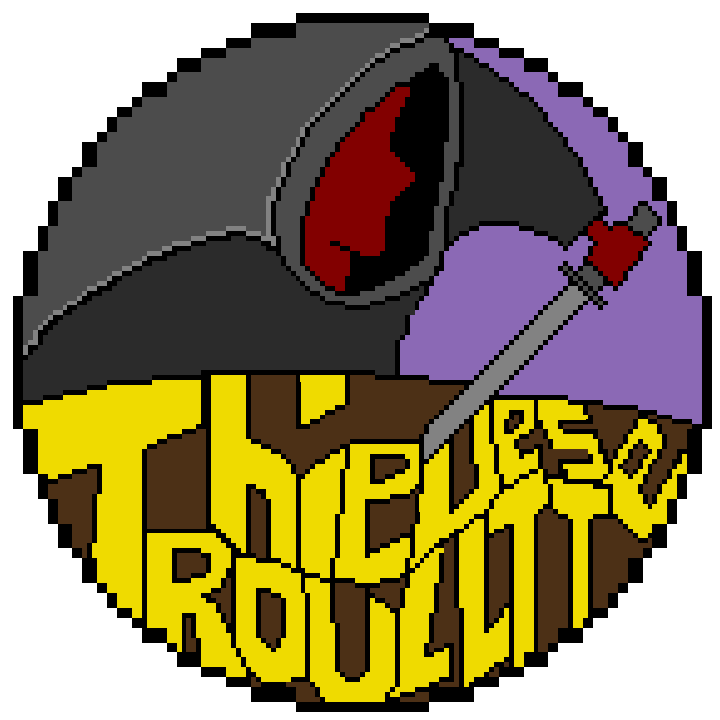 An invitation to the Thieve's Roulette! You come to the table, unaware of the challenge you are about to face. The sign said "Thieve's Roultte" but you soon realize that it was misspelled on purpose to lure in unassuming travelers. It was mean't to say "Roulette" but the graphic designer must have done this on purpose! The way to play is simple. Wait for a bag to drop on the table and then press the big red button to "SWIPE" the bag before your opponent . Red does damage to you, so it would probably be best to let the enemy grab those. Green heals and blue steals life from the opponent. When the bag drops and it is one of these, GRAB IT QUICK! These are the route to victory. Take the opponent's health to zero to win the game before they can do the same to you. One Sound effect was used from "SoundBible". Sound effect used is "Coin_Drop"